The corporate life of Liang Yunchao, 46-year-old chairman of By-health, ended symbolically early last year when he finally ceded his corner office to a colleague. In fact, he’d rarely been showing up for eight years. But the maker of dietary supplements, China’s largest in retail, remains very much his creation and run by his chosen lieutenants. “In a full year I probably don’t get to spend over seven days in the company,” Liang says in a hotel suite interview in Hong Kong, where on that day the Guangzhou resident’s business included art shopping. He says he keeps several Rodin sculptures in a warehouse there. This billionaire thinker is also a fast talker, and he says he needed to get his mind off day-to-day operations. “I don’t want company employees to feel like they are being watched,” he says. Besides, these days he needs two hours on average mornings for exercise to round out the healthy glow that his products promise. He is a marketing exemplar for By-health supplements like spirulina from blue-green algae and squalene, often from shark’s liver. (Liang plays down that line and says the killing of sharks, which he says aren’t endangered, is being capped.) Digestion, brainpower and other vital functions are said to improve with use. Every one or two years Liang grooms a select crop of future corporate leaders, both men and women, by testing their stamina and team spirit in “wildlife training” boot camps, at nature’s mercy. His favourite destinations: Teklimakan Qumluqi, the world’s second-largest desert, in Xinjiang; the Tengger Desert in Inner Mongolia; and Antarctica. By-health’s top management includes four founders, among them Tang Hui, who is in charge of the flagship By-health brand, and Liang Shuisheng, who is building up a mobile web services unit to seize on China’s expanding health consciousness. 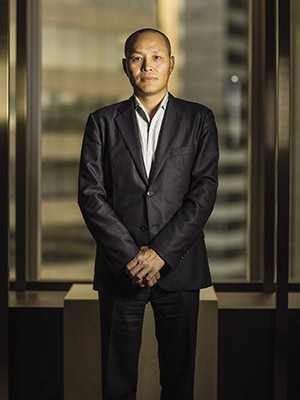 The executives meet for a monthly collective decision-making session, from which Liang also excuses himself even though he holds 49 percent of the stock, his net worth pushing $3 billion. The founder’s absence has proven to be the company’s gain: Revenue leaped at a compounded-yearly growth rate averaging 38 percent, and profit grew 40 percent over the last five years, even as China’s appetite for supplements began to taper. In 2014 By-health reported 1.7 billion yuan ($277 million) in revenue and 503 million yuan ($82 million) in proft, as it led in retail market share (over-the-counter pharmacies excluded) with nearly a third, more than the next four competitors combined. Its retail network reaches 40,000 outlets, up more than fourfold from 2010, and most of its distributors are tied to exclusivity clauses. A bout of ingredient scandals dented the overall industry, culminating in 2012 when China-made blue-green algae supplements and soft capsules were found to be laced with heavy metals. But a policy that Liang instituted in 2004 to orient By-health toward foreign suppliers proved propitious. From zero, the ratio of non-Chinese ingredients rose past 50 percent by the time of the company’s listing on the second board in Shenzhen in December 2010 and is now more than 70 percent (from 19 countries). That does not include what comes under foreign cover. Soft capsules, for instance, are from a China factory of France’s Rousselot. Foreign purchasing is more costly, sometimes by three or more times, but Chinese consumers are willing to pay. Its remaining major source inside China is nongenetically engineered soybeans grown in the northeast. Globally, “these non-GMO soybeans are difficult to find,” Liang explains. Soy protein blend is a line By-health particularly dominates. Next up for By-health may be its own offshore organic farms and buying foreign brands. For supplements, “it all depends on the quality of raw materials, the quality of the soil. It’s not as complicated as drugs and medicines,” Liang says. To underscore the integrity of its manufacturing, By-health in 2012 opened see-through assembly lines at its massive production centre at Zhuhai, Guangdong province. Three plants there will be joined by a fourth, the biggest yet, around year’s end. Visitors can peer through windows at bags of foreign ingredients stored neatly on shelves by their country of origin. Soft gels roll out from automatic trays at a speed of 160,000 capsules per hour. The equipment also is largely foreign-made. The company says 20,000 people a year come to watch—500 were being received on the day Forbes Asia was in town. “We plan to make the production process available in real time on the website, so customers in a retail outlet can see it,” says Liang. In October the Chinese government is instituting tighter standards for new product approvals even as it loosens the constraints on previously cleared lines. This will largely spare By-health, even as it hits foreign entrants into retail like GNC and NBTY, which have registered only a relatively few of their extensive offerings from the US. Liang, who’d previously been active in traditional remedies, got interested in America’s appetite for supplements in 2001 during visits to the US as his wife sought a degree in information technology. Walking through supermarket aisles stuffed with colourful bottles of vitamins and minerals, he figured this would work in China too. The product-integrity efforts are also applied to retail: A global tracking system will soon allow registered consumers to track the origin of ingredients. For distributors, retailers and business partners, a second layer of database-tracking would show scans of official documents and papers, import certificates and government approvals, all the way back to suppliers. Like many in retail, By-health’s future may lie in China’s booming ecommerce. The new mobile web health services unit, formed with an alumnus of Alibaba Group’s Ali Health, will work with outside nutritionists, health clinics and soon hospitals. “We don’t want to just sell products; we want to meet clients’ needs, cater to their diets and their exercise habits, to help and guide them on the use of supplements,” says Liang. One example: Supplements to help pregnant women who have diabetes problems lower their blood sugar without medications.